No one defending their land and territory in Honduras is safe. That was the message that rang loud and clear after Berta Cáceres was murdered in her home on March 3. Cáceres, an Indigenous Lenca woman, mother and grandmother was founder of the National Council of Popular and Indigenous Organizations of Honduras (COPINH), and worked tirelessly to protect communities at risk of eviction and relocation because of large scale projects that put their lives and livelihoods at risk. Despite being internationally recognized, most recently after winning the 2015 Goldman Prize, Berta was killed in her home by unknown gunmen. Her Mexican friend and colleague, Gustavo Castro, founder and director of Chiapas-based Otros Mundos (Other Worlds/Friends of the Earth Mexico), was also wounded in the attack. At the time of her murder, Berta was the beneficiary of precautionary measures ordered by the Inter-American Commission for Human Rights—an order with which the Honduran State did not comply. Berta and her colleagues have repeatedly denounced the criminalization, threats and violent repression that Indigenous communities have faced for defending their homes against the transnational extractive industry. Even before the 2009 coup d’état, communities had spoken out against the Agua Zarca Dam along the Gualcarque River in Intibucá, Western Honduras, sacred to the Lenca People who depend on it for their subsistence. Later, communities found out that another hydropower project along the nearby Canjel River was also being built and began a series of protests to denounce the project. After Berta was killed, over a hundred and twenty national and regional organizations and institutions called on the Canadian government to condemn the murder and to call on the Honduran government to support an independent, international investigation into the crime as requested by Berta’s family and COPINH. A four-sentence press release from the Canadian Embassy to Costa Rica, Honduras and Nicaragua was issued the day that Berta was murdered. In it, it vows to give “support to projects and Honduran organizations” in order to promote the protection of human rights in the country—a problematic strategy given growing opposition to Canadian projects that have no community consent. Canada has played a significant role in Honduras since the 1998 hurricane, and later the 2009 coup d’état. In 2014, the Council on Hemispheric Affairs (COHA) wrote, “The self-proclaimed peacekeepers have since built a stronghold over Honduras via investment in industries and support for the illegitimate government created in the wake of the coup. Canada’s relationship with Honduras is emblematic of its shifting position within the international community, as an imperial presence, establishing and expanding industries in the less developed country at the expense of local citizens and the environment.” Canada notoriously pushed for a new mining law post-coup and later passed a free trade agreement with Honduras to promote Canadian investments despite serious human rights and environmental implications. As thousands of people gathered for Berta’s wake and funeral in her town of La Esperanza, her daughters, son and mother spoke defiantly, “We know with certainty the reasons for his vile murder were her resistance and struggle against the exploitation of nature’s common goods and her defense of the Lenca people.” In many ways, Berta’s struggle went beyond the land—it was a struggle for all people working for a more inclusive and just world. Carlos H. Reyes, well-known Honduran labour union leader and member of the National Resistance Front, also spoke out on behalf of social and civic organizations: “Berta gave her life for Honduran sovereignty. The intellectual murderers are those who benefit from this death, those who usurp sovereign power, devastate our territories and the natural common goods. They overexploit and crush the rights of the working class in rural and urban areas and plunder the resources of public institutions, promoting the privatization of social services—and the country itself—in an attempt to subjugate the people.” He went on to call for an end to resource extraction licenses and hydropower projects on Indigenous territory. No, no one was safe after Berta was murdered. But less than two weeks after her murder, it still came as a shock when Nelson Garcia, another member of COPINH, was murdered in the middle of the afternoon on March 14 despite the world’s attention focused on Honduras and the Indigenous rights organization. Garcia was a 38-year-old farmer and community leader and father of five. That morning, he and the other residents of the Rio Chiquito community sustained a violent eviction carried out by Honduran security forces. Despite the community having lived on the land for the past two years where they had built houses and sowed crops, it was destroyed by police and military who brought in bulldozers to displace the community in resistance to the Agua Zarca dam. After news of Garcia’s murder broke, and a significant amount of public and organizational pressure mounted, the European funders of the dam—notably the Netherlands Development Finance Company (FMO) and the Finnish Fund for Industrial Cooperation Ltd—suspended financial backing for the dam project, though there is no definite certainty about its future, or the four Hydrosys projects. Responding to the suspension, the Honduran Committee for the Families of the Disappeared (COFADEH) warns not to see the financial institutions as heroes in this tragic story. “We applaud this tardy decision. However, we profoundly regret that both States—Holland and Finland, once human rights defenders—did not act to avoid Berta Cáceres’ murder, with whom they had peaceful meetings, before the crime was committed.” Berta’s family is asking that in addition to suspending financing to the project that the financiers pay damages. No government or financial institution, or company, involved with hydropower projects in Honduras can claim they don’t know the human rights risks and the threats that communities face when they exercise their right to say "no" to such projects. In the meantime, Gustavo Castro, the lone eye-witness to Berta’s brutal murder is still unable to leave Honduras by orders of the Honduran State. He has made his temporary residence in the Mexican embassy despite a treaty on mutual legal assistance in criminal matters that exists between Mexico and Honduras. In an open letter to the Honduran People on March 17, Castro writes, “We will let neither murders nor weevils cloud hope or the landscape. Soon there will be justice.” He has vowed to continue working to defend his own community and partner groups throughout the region. Since 2013, including Berta and Nelson Garcia, five members of COPINH alone have been murdered defending their territories and life. Hydropower projects throughout Mesoamerica have generated conflict and violence in Indigenous communities in resistance which will only increase as mining concessions continue to be granted, and biofuel—African Palm—production increases. Cheap and so-called green energy is in demand to make these other projects a go. Jackie McVicar is a member of the Atlantic Region Solidarity Network (ARSN). ARSN is a network of groups and individuals who are working in solidarity with people struggling for social justice and environmental protection in Latin America, the Caribbean and Atlantic Canada. 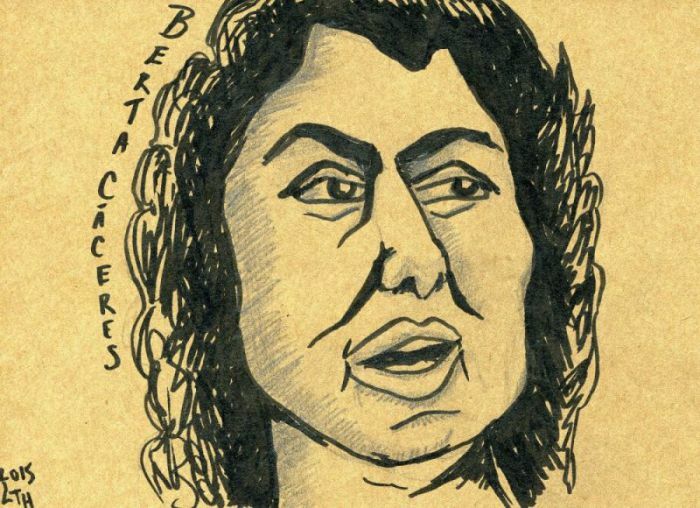 She first met Berta Caceres in 2009 following the military coup d’état. 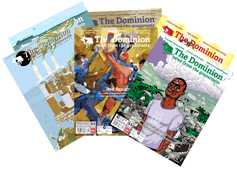 This article was originally published by Canadian Dimension.